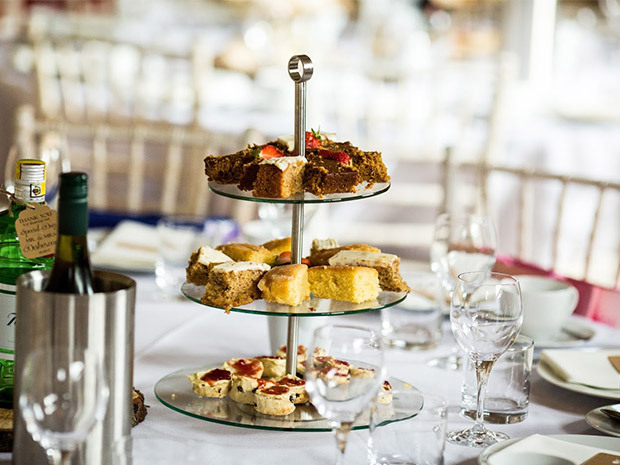 Following a romantic proposal in Bali, Natalie and Rob Desborough tied the knot with a rustic countryside celebration at The Barn at Upcote, complete with afternoon tea, music from The Chip Shop Boys, and gin-themed décor. Rings including engagement ring: The engagement ring is a diamond twist from Ernest Jones and the wedding rings were designed and made by CoolJoolz. 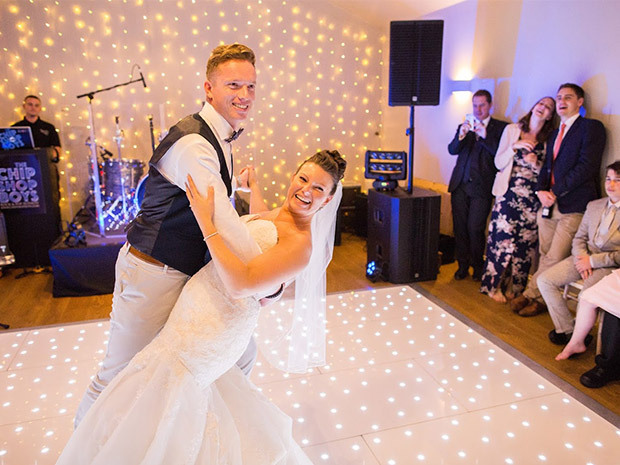 We were both on a night out in Cheltenham at one of its main nightclubs and whilst in the piano bar listening to the sounds of the piano player (who ended up being the husband of one of Natalie’s colleagues and ended up playing the ceremony music at our wedding), we got talking at the bar. Rob popped the question on a romantic holiday in Bali. He had organised a rooftop meal overlooking our hotel ‘The Maya’ and the beach. We had live traditional Balinese music playing and a canopy over our table, which was covered in flowers. He went to the toilet for a really long time, and it just so happened that he went back to the room to get the ring. When he got back he said the moon looked really beautiful and wanted to take a photo of me in front of it overlooking the ocean. I did this and then just as I thought he was going to take the photo, he got down on one knee. He proposed to me on the 19 August 2016 and we got married on the 18 August 2017, so 364 days. From the moment we drove around the corner and saw the driveway and the steps we knew it was the one for us. 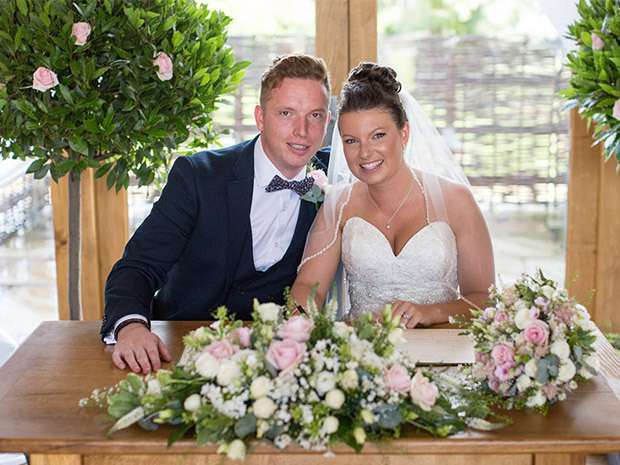 We wanted a sense of togetherness and the venue really brings everything together. Each building flows really well into one another, so there is never an aspect of feeling separated which can happen so often with other venues. We both grew up in the countryside and love being outside. We are the happy owners of four gorgeous collie dogs so spend most of our time walking through fields and woods. The inspiration came from wanting to bring the outside in. 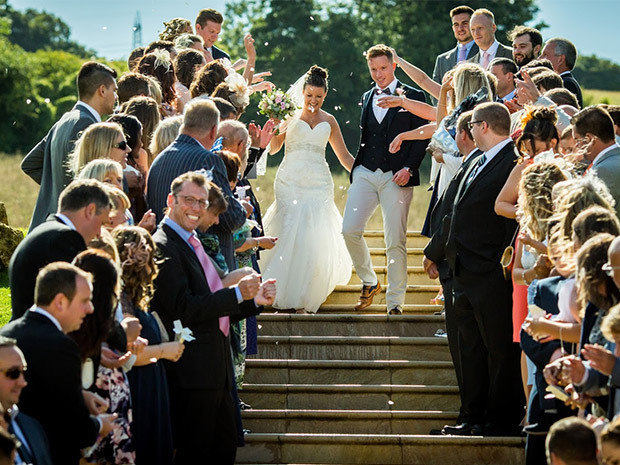 We had been following Brad’s photos for a while as Rob went to the same secondary school as him and he had photographed other people’s weddings that he knew. We love the way he is able to capture moments in a non-intrusive way. We didn’t want very many posed photographs as we didn’t like everyone with ‘fake smiles’ so there were lots of action shots. 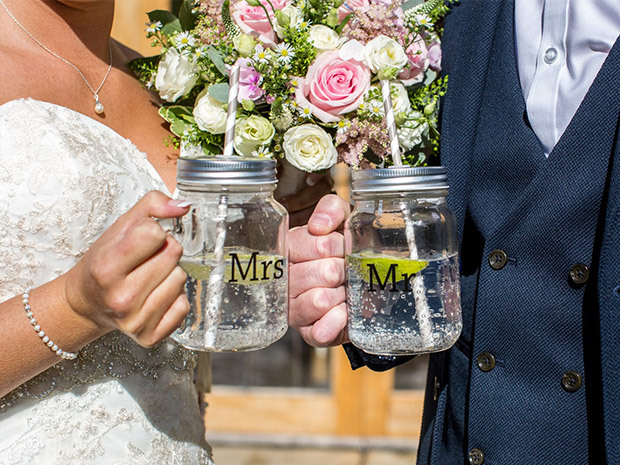 It was a DIY affair with lots of ideas from Pinterest and Natalie’s best friend who was getting married a month before. 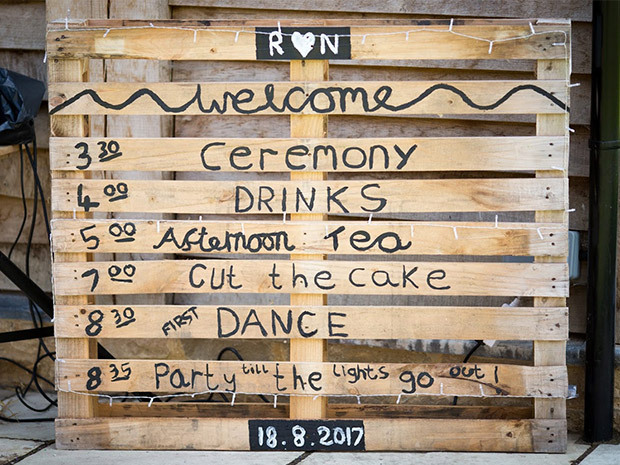 Natalie created the order of the day sign, which was painted onto a wooden pallet, as well as the seating plan, which was done in a similar way with a wooden pallet and cards pegged onto it to show where guests would be seated. 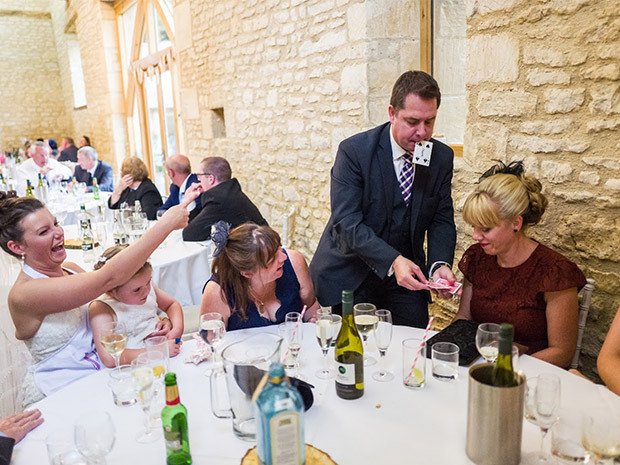 Natalie also collected gin bottles and put labels around the necks of them to create centrepieces for the tables as gin is our favourite drink. 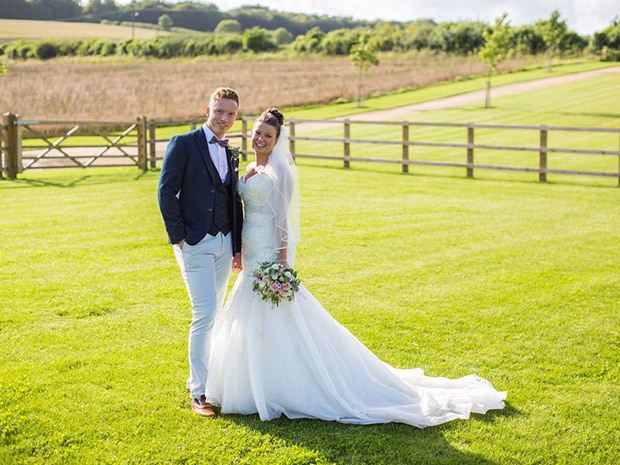 Natalie got her dress from Cotswold Bride which was called ‘Louise’ by Alfred Angelo. 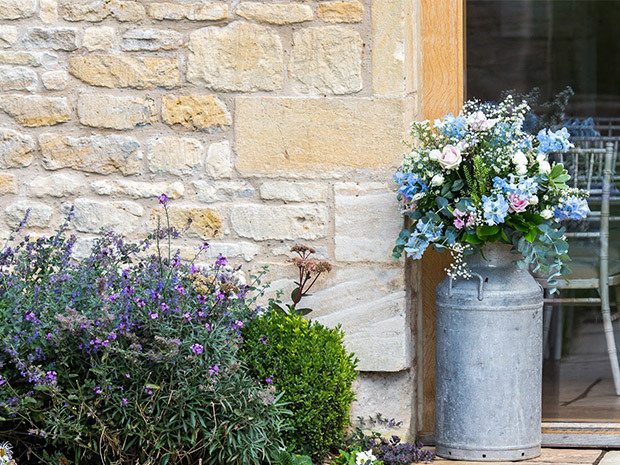 Georgie, the owner of Cotswold Bride, was so helpful and Natalie wouldn’t have had the experience without her. It was a strapless, sweetheart neckline with a champagne lace over an ivory underdress. It had a dropped waist out into a fit and flair. 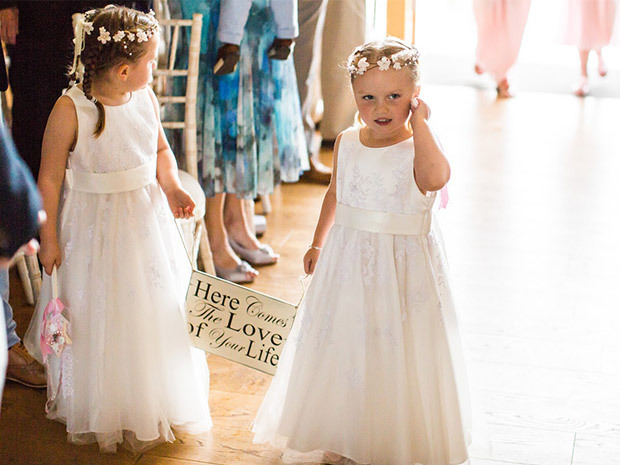 Natalie added a sparkly belt to the middle to give it a bit of sparkle, matching the veil which also had sparkle and pearl edging. Rob wore grey chinos with a white shirt. 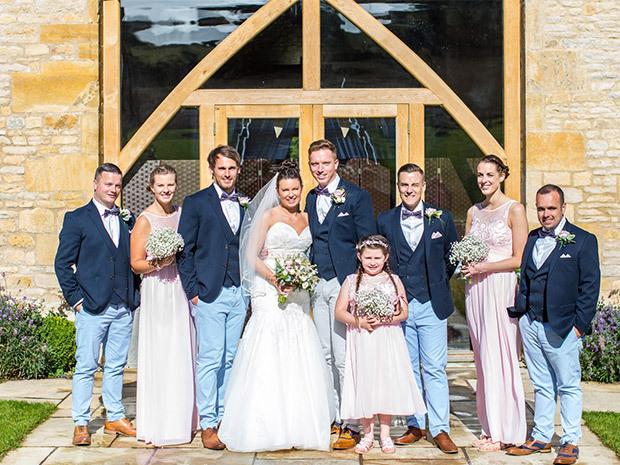 A matching navy waistcoat and jacket finished with a navy and pink flowery bow-tie. 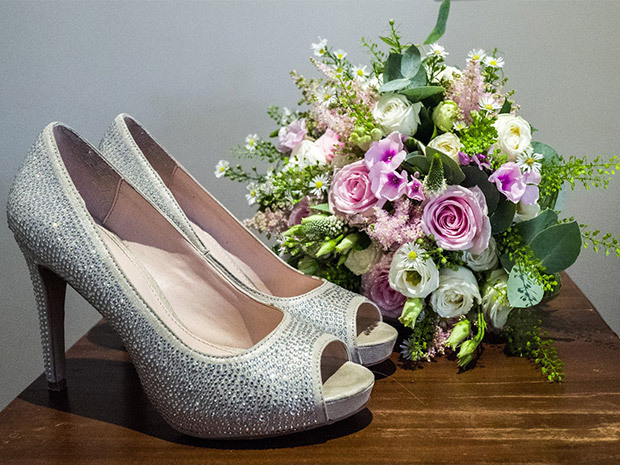 Natalie had her late Nan’s earrings wired into her bouquet to add some sparkle. Natalie also wore the same garter that both of Rob’s sisters wore on their wedding day; it’s hoped that the daughters from here on in will also wear it. Yes; something old was the earrings in my bouquet, something blue was a blue heart sewn onto Natalie’s garter which had been worn previously by Rob’s sisters so this also counted as the borrowed aspect too, and something new was the wedding dress. ‘A Thousand Years’ by Christina Perri. We had an afternoon tea. 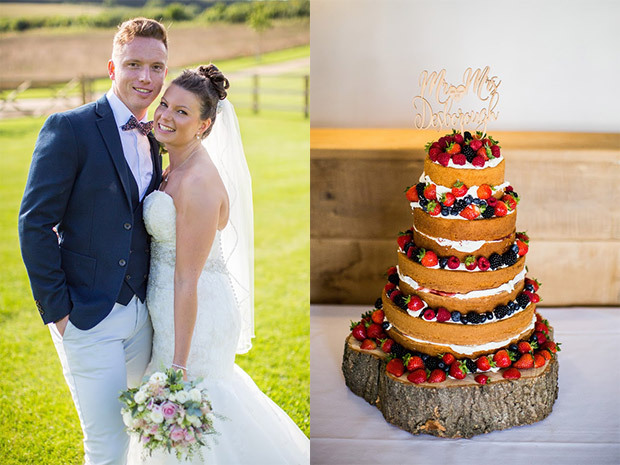 We went for a naked cake, choosing Victoria sponge with forest fruits surrounding its layers. We had ‘I’ll Be There’ by the Jackson 5. It was a special song to us as we were trying to decide what to have then one day it came on when Natalie was in the kitchen and Rob was in the living room and as soon as we both heard it we both shouted ‘this is the one’. The wedding breakfast. Sitting back and looking at all of our guests knowing they were all there to celebrate us. It made us feel extremely loved and grateful to have them all in our lives. Dancing with the Chip Shop Boys was also amazing! Not a major one but it rained. 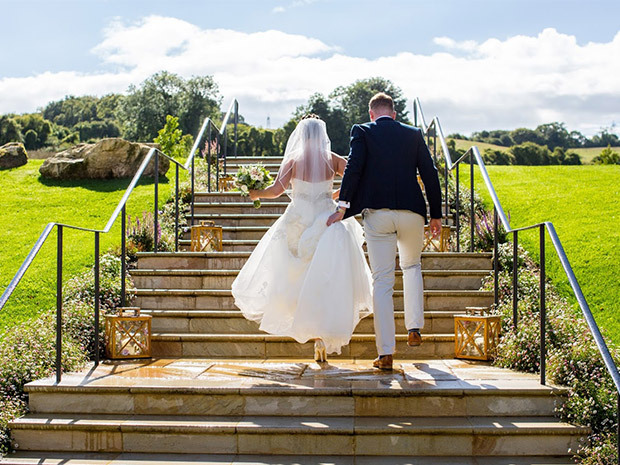 This meant that Natalie’s entrance was a lot shorter than planned; she wanted to walk down the beautiful steps that enter the venue, but due to the rain it would have been too slippery and dangerous. It totally didn’t matter though! Make a list! Research your photographer as they are the ones that will capture your memories forever. If there is anywhere in a wedding to spend money this should be it. Think about what really matters to you and spend your money there. It is about you being happy and a day that you will remember. No, I don’t think so; we researched a lot. We went on a safari in Kenya. It was an amazing experience and something we had both always dreamed of doing. We travelled through four different national parks: Amboseli, Lake Naivasha, Lake Nakuru and The Masai Mara. 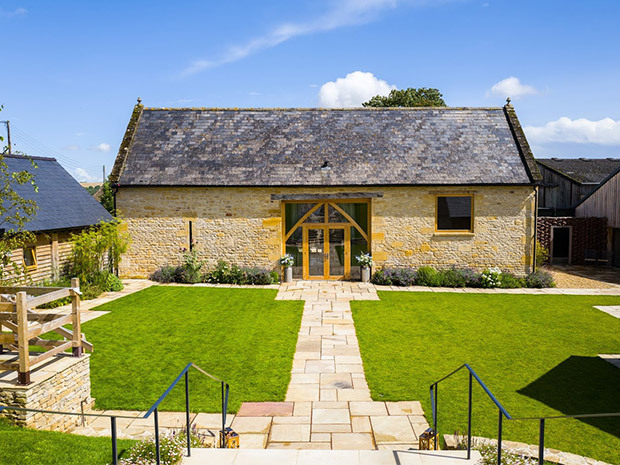 If Natalie and Rob’s Cotswold wedding has inspired you, see The Barn at Upcote, call (01242) 890332, email jo@thebarnatupcote.co.uk, or visit thebarnatupcote.co.uk directly.